Directed by Jackie Gosselin, this DynamO Théâtre production takes well-known and well-loved work, turns it a little bit on its head, and sets it back down for a younger audience. ‘What if?’ is a dangerous and compelling line of questioning that sparks reflection and regret… It can also be the spark of deeper contemplation. What if two warring families had instead put down their weapons? What if two star-crossed lovers had made it out alive? What if Romeo and Juliet… is a youth-friendly adaptation of one of Shakespeare’s most famous and oft re-envisioned works, this time expressed through dance and acrobatic movement. Addressing the play’s concepts of love, hate, and fear in a way that is accessible and entertaining to children without pandering to or belittling their intelligence, this production was thoroughly enjoyable as an adult. It was delightful to hear when aspects of physical comedy thrown in elicited solid laughter from the kids, which happened fairly frequently. Rosalie Dell’Aniello, Jérémie Earp, Agathe Foucault, and Rémy Savard switch seamlessly from character to character as they’re introduced, playing all parts to sometimes comical effect. It’s a nice way of skirting what could potentially be a very crowded stage stiff with tulle, ruffled shirts, and sorrowful soliloquy. It also stands to reflect that as each actor can easily slip into the skin of each character, we, as the audience, are all reflected in these tropes. Within each of us lies a Mercutio, a Thibault… Poignant moments were well-expressed and that pivotal love at first sight moment where Romeo and Juliet finally meet was stirring and well-orchestrated. Most of the performance occurred on a rotating stage, used skilfully as a way to enlarge the small space and better portray movement – it was a nice touch to be able to see the acrobatics from all sides, which were executed cleanly with very solid choreography. 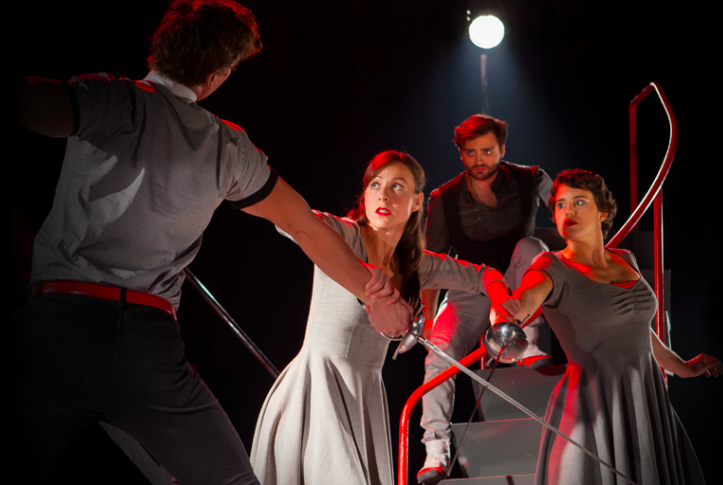 The small stage was further enhanced by the use of two spiralling staircases on wheels, with actors occasionally flipping or throwing themselves dramatically from the top to be caught smoothly by their colleagues. As with any good rendition of Romeo and Juliet, there was clever use of sword fighting and a very kid-friendly interpretation of a banquet with juggled goblets and sensible chuckles. Very well lit, and with good use of music, the production was very tight and overall pleasing to all ages. A quick note, however — there are a few strobe-effect lighting moments for those sensitive to it. Engaging, entertaining, and a lovely reinterpretation of a classic, What if Romeo and Juliet… departs nicely from the original story while keeping the essence of the work well in mind.